April 24, 2009 -- Professor Adrienne Cool has discovered 24 unusual stars in an ancient star cluster in the Milky Way. Made of helium rather than the usual carbon and oxygen, these white dwarf stars appear as faint, pale blue dots as spotted in new Hubble telescope images. In a new study, Cool and former SF State graduate student Rachel Strickler suggest that these stars are coupled with close companion stars, which may explain how they came to be formed and why they are made of helium. "Helium-core white dwarfs have only about half the mass of typical white dwarfs, but they are found concentrated in the center of the star cluster" said Cool, professor of physics and astronomy. 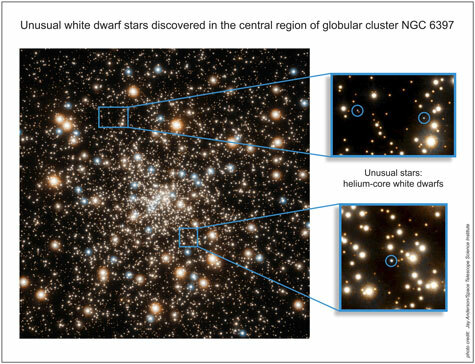 "With such low masses, the helium-core white dwarfs ought to be floating all around the cluster, according to theory. The fact that we find them only in the central regions suggests that they have heavy companions -- partner stars that anchor them to the cluster center." Cool and her collaborators suggest that these helium-core white dwarfs have had their lives cut short by the partner star, which has interfered with their normal development and stopped the star from fully maturing. Cool and Strickler, now a doctoral student at University of California, Santa Cruz, co-authored the study with collaborators from the Space Telescope Science Institute, Indiana University and the Max Planck Institute in Germany. It will be published in the July 1, 2009, issue of The Astrophysical Journal.